to increase the minimum wage. 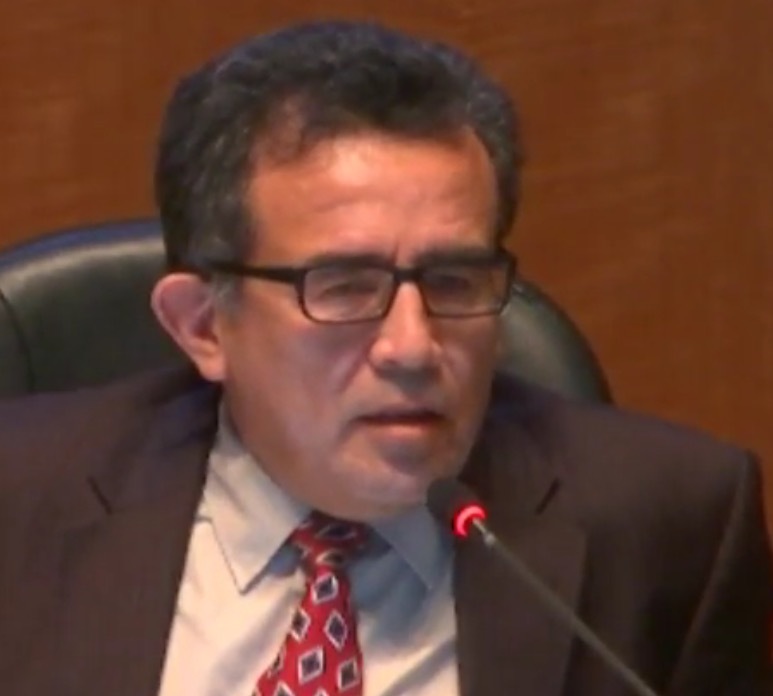 After the Hayward school board unanimously approved a resolution giving its unrepresented employees a boost in wages to $15 an hour on Wednesday, school board trustee Luis Reynoso said he wants to make it city and countywide. The increase is effective immediately and covers only district employees not represented by unions, a small number of the entire workforce, but ensures every employee is at or above the $15 threshold. Currently, no union-represented employees earn below $15 an hour, said a staff report. “This sets everyone straight. If you want to work with Hayward, you have to pay workers $15 an hour,” Reynoso said in an interview. During Wednesday’s meeting, Reynoso again challenged the Hayward City Council, a frequent target of Reynoso’s after it sought to unseat him in last year’s November election. Hayward city officials, however, have proven unresponsive over the past few years about enacting any minimum wage increases above the state’s recently approved law to stagger wage increases to $15 an hour by 2022. In the meantime, some East Bay cities such as Oakland, Emeryville, Berkeley and San Leandro, citing the high cost of living in the region, have moved to accelerate the increase. He told the East Bay Citizen an additional proposal to bring a rent control measure to Hayward, similar to one attempted in Alameda last fall, is in the works. Posted in Hayward, Hayward City Council, hayward school board, hayward school district, Luis Reynoso, minimum wage, rent control. Bookmark the permalink. Reynoso should run for City Council. He's a man of action. City Council is all talk, no action. Babbling boneheads who would rather install their puppets on the School Board than help all the citizens of Hayward instead of Data Dobbs. Rent Control, raising the minimum wage? Hell no, Hayward City Council always falls back on ways to raise taxes and wastefully spend our hard earned money. Go Reynoso! But the key issue is whether it will actually be enforced – or whether it is just a PR move by a bunch of phonies who pretend to be liberals. For instance, there was the project one of AC's public hospitals gave to an outside contractor for work in a hospital kitchen. However the County was not willing to pay enough to have the project done so that the contractor could pay its employees the union rate while they were working on that project. However, union rate was approx. twice as much as that employer, and whose workforce was largely composed of Hispanics and who also spoke very little English, normally paid his employees. So therefore that outside contractor got cute so to “prove” to Alameda County that he was paying the required union rate. More specifically, he had the paperwork and paychecks made out so as to indicate that the employees were getting paid union rate, but supposedly only working twenty hours per week, and even though actually they were working forty hours per week. In other words if he was working them forty hours per week but only paying them $7.50 per hour, and which would have come to $300 per week, instead he pretended that he was paying them $15 per hour, but only for twenty hours per week, and which would have still come to $300 per week. And in regard to whichever employee of AC government was monitoring and providing oversight, AC government is full of “experts” and managers who will pretend to believe virtually any story and wild lie, and no matter how obvious it is that it is blatant and flagrant fraud. And the above is just one example, and I could give plenty more, of the Bay area's “liberal” politicians going through various charades so as to “prove” that they are strongly committed to paying an adequate living wage – or in general defending and protecting the poor and the disenfranchised. I was watching the same meeting. The woman that spoke in comments is getting her raise to $15/hr effective 1/1/17 Is about time someone with a backbone starts something for minimum wage in Hayward. Yes, if anyone is going to go after this it has to be that pitbull Reynoso. Go Reynoso! Finally!! For details, study the US auto industry, and which over the last few decades has found ways to build the same amount of cars, or perhaps even more cars, with a drastically smaller workforce. And I used to work in a business that had approximately twenty janitors. So the janitors' union negotiated a ten percent pay raise. And then almost immediately after the new pay rate was in effect, the business then laid off two janitors, in other words ten percent of the crew. And I have also seen instances of employees feeling pressure to work considerable unpaid overtime to keep a boss happy, and even in some instances in which the employees were represented by a union (although obviously not a very strong and effective union). I knew a guy who worked as a low level supervisor, was extremely competent at what he did and very valuable to his employer. He had started at the bottom with his employer and worked his way up. However since he was not born in the US and his English was extremely shaky, he would have interviewed extremely poorly if he had tried to change jobs. His employer treated him extremely well while the business was very profitable, but then as the business started to struggle, he had to put in tons of unpaid overtime redoing the work of lower ranking employees who had preformed their tasks improperly. But again, the big question is whether even if wage rates go up considerably, will payrolls also rise considerably – or will the employer use various gimmicks to keep total payrolls down. Hayward City Council forms task forces, committees and teams but never really accomplishes anything. Wasting tine and money talking things out and making lists about what should be done. Fake slogans and catch phrases like “No Room For Racism” while other ciries actually pass rent control measures and make a real effort to effect change. We need a new mayor and a leadership change. Talk is cheap. Do something other than ramble nonsense like Mark Salinas always does. He is so boring. Zzzzzz! Go Reynoso. He takes action and is looking out for the poor. The people elected Reynoso. He is not bought off. He works for us! Our city council needs to be replaced. Residents need research and find out what the council doesn’t do and what they over spend on.They do not want to raise the min-wage faster then the 5 years given by the state. We all need to be informed and evolved, when voting for good leadership. Don’t vote for the union endorsed candidates. Candidates will owe favors, to endorsers who donate lots of money. The public needs to endorse the candidates they believe in and donate some money for campaigns. Many of the union endorsers and real estate endorsers do NOT live in Hayward. Hayward needs their cameras replaced and radios that work in the schools, for the guards. A boy went to Hayward High with a gun last week. The guards said,” They don’t even know what he looks like , because the cameras don’t work.” Many radios don’t work either. This is an accident waiting to happen. Write or speak to the school board members about allocating money for security equipment, NOW.. Write petitions to get security equipment. Your children and school staff is NOT safe in our schools. They had a lock-down and no cameras to see the armed boy. That kid can return and shoot people before the next school board meeting. Why are the police, at schools, paid from the school budget and not the city general fund? We can get armed security guards at half the price. They have to call 911 when a shooting or lock down occurs on the city’s funds. The police will have to come on a 911 call. These expensive city police are no protection, if the cameras don’t work and you can find the shooter. Many security guards are retired cops. This will save money and the district will have money for security equipment. Many cities have active shooter drills in the schools. Are we doing that? Why hasn’t our school police complained the school cameras don’t work and the guard radios don’t work? Have the school police trained the school guards on how to stop a student fight, when your equipment doesn’t work and you can’t get backup? The office workers need to know how to use the cameras during a lock-down. Prey no one gets shot, while the security equipment isn’t replaced. Contact the trustees. Thank you Dr. Reynoso, we appreciate you! I thought that a bond that was recently passed was suppose to go towards improving the infrastructure of the schools – repair or replace the existing UTILITIES to provide a safe and healthy place for learning in the existing structures, not have a bunch of vultures swoop in and try to divert these funds for building even more new special state of the art structures and not putting this money for its intended use to fix and repair what needs to be fixed and repaired. This is a wonderful gesture. However, I would like to see the AB1200 document submitted to the County published. This will show everyone the total burdened costs and can the district afford it. Also, once the lowest salaries are adjusted upward some of them will surpass other salaries and those will need to be fairly adjusted due to job of more difficulty. How much is that going to costs ? This will trigger adjustments throughout and we need to see what those costs are going to be ? Finally, how many full-time employees will now have their hours reduced or laid off or open position not filled to avoid benefits to offset the increase in salaries? Perhaps, the district should have developed a plan to scale the increase, rather than a budget shock that might cost the loss of jobs. Fix the old, that needs fixing, and keep the old running before you start building the new dreams. Otherwise, the District is going to sucked into a whirlpool of financial debt that has been long neglected. The District needs to address aging maintenance problems such as roofing, underground utilities such as sewers, water, gas, and storm drainage. It's not an issue until the problem arise such as our recent storms. Another issue has been contracted work that was not properly scoped out and is in violation of codes. Quit blowing away the taxpayers money for administrative frills.